On Sunday 28th April 2019 and Monday 29th April 2019 the bus routes of all our lines will be according to the Sunday-Holiday timetable - schedule. 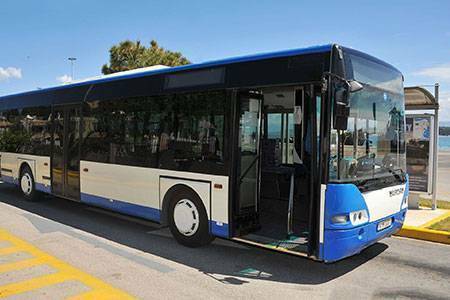 We would like to inform you that on Friday 26th April 2019 the last bus route to DASIA – IPSOS will be at 00:00 from San Rocco square. We would like to inform you that on Saturday 27th April 2019 the last bus route to DASIA – IPSOS will be at 01:00 am from San Rocco square. Please be advised that from 9:00 am on Thursday, April 18, 2019, until 9:00 am on Saturday 20th April 2019, due to “Public Water & Sewerage Company’” works, there will be a traffic stoppage in the KAISER BRIDGE. The routes of Bus Line No 10 “Achilleion” will terminated in PONTI area instead of the normal end, until the end of the works.